And by "tiny," I mean a bust of 31 1/2. (Yeah, like that half-inch is going to make ALL THE DIFFERENCE.) Claire sent me this one — I'm sure she didn't mean to be cruel, but, oh, how I want this pattern! If this blog were a movie, right now there would be a montage of me sitting pensively in many picturesque places, thinking of this pattern. I know, I know, with ten minutes' dedicated study I could size this one up to my measurements, right? But — that makes sewing feel so much like WORK. Or perhaps I'm just not dedicated enough. All I know is, a few inches either way, no problem; more than five and I'm just not enthused enough to try. Ask all the 32-inch patterns sitting forlornly in boxes in my sewing room right now! I feel like offering a bounty on this. Find a copy for me to buy in anything between bust 35 and 39 and I will send you a signed copy of my new book … how's that for an enticing offer? If you want the B31.5 version, hop to it … the auction could end at any second (it's a Buy It Now), and ends for certain late tonight. Oh my god! Erin, you’ve saved Ramakwanzachanamas! This is the perfect book for everyone I know!Okay, not everyone. But all the ones who’ve been really good this year.Congratulations! 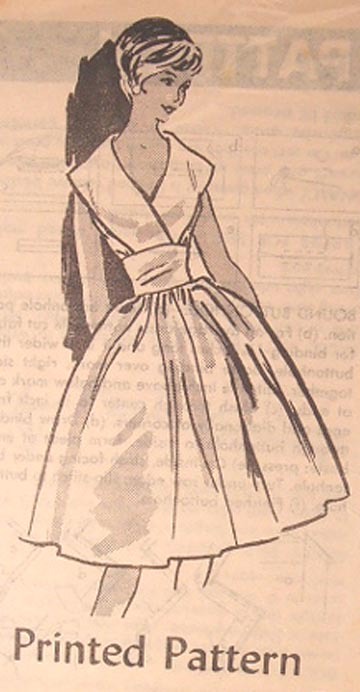 Why, oh why, must 88% of all of the available vintage patterns be tiny?Because the patterns for larger women (starting with, say, bust 33 and up) were actually bought and used! Although I wonder–if the bust/waist, bust/hip, and bust/height ratios were the same as yours (a 10 petite? ), could you play around with a large-scale copier and enlarge the entire pattern? I love the shawl collar. *le sigh*And I have bookmarked the link to your book. Happy Holidays! ohmygod! I have been enjoying your sewing blog for some time, but had no idea you were a famous wordsmith. Yikes! I just used ohmygod with someone who writes books about words. Anyway, I’m delighted to see we share another passion. Congratulations on the new book. It looks wonderful. I used to be that size. 😀 When I was really small chested. And I think I do know some people that size as well. So it’s not that odd. That extra 1/2 inch probably indicates that it’s a “half size” which is for short (not petite) (and usually stocky) women. It might be too small to grade up to your size, but if the pattern is cheap enough, it might be worth it! The dress is really, really cute. I can’t imagine how that bodice would ever lay nicely across something bigger than a 31 1/2″ bust though. Perhaps I lack in imagination. I can’t for the life of me find the post I am thinking of in which several books on fitting were recommended. Can you all give me your favorites again? I’m ready to purchase and want to make sure I choose well. Robinson — I think it was this post: http://www.dressaday.com/2006/09/sew-u.htmlAlso, since this blog is run off the blogger template, searching Google (or ‘googling’, as you will) for the string “dress a day” and then whatever you’re looking for often works. It’s faster if you use Google Blog Search: http://blogsearch.google.com/Have fun! I love google blog search! Thanks Erin. Robinson, I’m going to make yet another pitch for “Fit for Real People” by Palmer and Alto. No, I don’t have stock in the book, but I wish I did. If you were going to be limited to one book on “how to fit,” I would recommend this one. Robinson, and to all the folks in general, I’m going to add one caveat about re-sizing patterns: Quite often, sewing books will tell you to take the difference between your measurements and the pattern’s measurements (doesn’t matter if you’re sizing up or down), and to divide the difference evenly amongst all the seams, until the pattern’s been altered. The caveat? Don’t divide the difference “evenly” unless the difference is actually distributed evenly on your figure. If you need to enlarge the waist 3″, and your dress has princess seams, it will do you no good to add to the back seams, if the reason the waist is 3″ bigger is because you have a belly! And if your dress is 3″ too tight through the hips, and it’s all in your bottom, you don’t need to add anything to the seams in the front in order to make it fit. It helps to apply your knowledge of your own figure to the information sewing books provide! Thanks La Bella. I have the book on order now. I’ve learned so much about why my attempts to learn to sew in the past were all acts of futility since I started reading this blog. Having a quality sewing machine makes a difference. Having a quality pattern makes a difference. Having a quality reference book will make a difference. And the inspiration doesn’t hurt either! I didn’t know you had a BOOK! And the cover is illustrated by Roz Chast, how utterly PERFECT! There’s a funny ad in magazines for some soda that shows a girl trying to squeeze into a dress in a fitting room and it says, “If it doesn’t fit, it was ugly anyway.”Think this a few times and it may help. I just received a copy of this new book. Thanks Erin, it was very sweet of you to thank me with a thank you gift for my thank you gift…..Thank you. I was thinking out loud the other day, “I need a good book to read.”…and one arrived in the mail! I found out I am an aquabib and a whole lot of other “a” words that make me sound interesting. I am going to use them in my next personal ad. Again, Thanks for writing fun and cheerful things for people to enjoy because joy is fun to experience!May your world always have exactly enough beautiful patterns, fabrics, and words to enjoy.Sarah. Great idea, india,! I have a few such presents to buy. hooray, i just bought two copies of your book from a South African book store. One for me and one for my mom who is an English teacher. OMG – ERIN, that’s YOU?? VERBATIM is one of my favourite books for dipping into! I must have read it 5 or 6 times! And now I find out that the Dress a Day GODDESS is the VERBATIM Goddess?I must retire to my fainting couch. Ooops, never mind, wrong interpretation of “anything”.. I have the opposite problem, I cannot find any patterns small enough! I’m 30 inches around the chest area!